All that is known of the first recorded attack on the monastery at Corcach Mór na Mumhan was that it occurred in A.D. 820 and the most valuable treasures were plundered. It is also known that it was raided four to five times in the ensuing one hundred years. The marshy environment would not have been entirely welcoming, but the Norwegians nonetheless established a settlement or longphort here. We cannot be sure of the exact location of the Viking town, but it is known that in AD 848 a settlement base called Dún Corcaighe, or Fort of the Marshes, was besieged by Olchobar, King of Caiseal from North Munster. It is thought that it was located on an island, the core of which could be marked by South Main Street, an area that was developed in ensuing centuries by other colonialists. With this in mind, Dún Corcaighe would have been located strategically near the mature stage of the River Lee, and therefore would have controlled the lowest crossing-point of the river, whilst being sheltered by the valley sides. The Norwegians established a maritime network with other Viking ports, namely those at Dublin, Waterford, Wexford, and Limerick. The Norwegian presence in Corcach Mór na Mumhan was interrupted by invaders from Denmark circa AD914 who also attacked other Viking towns in Ireland and gained control of them. In Cork, these new invaders – the Danish Vikings – started off by raiding the monastery on the hillside but soon turned their attention to wealthier and more powerful Gaelic kingdoms in Munster. The Danes decided to settle in Ireland. They took over and adapted existing Norwegian bases and constructed additional ones to a similar but larger design. Unfortunately, the information available regarding a Danish settlement at Cork is historically and archaeologically deficient compared to that arising from excavations in Waterford and Dublin. Nevertheless, there are some clues that give an insight into the location, structure and society of Danish Viking Age Cork. It is known that there were at least three main areas of settlement: firstly, they lived on the southern valley side next to the monastery, the core area of which is present-day Barrack Street; secondly, they settled on a marshy island now the location of South Main Street, the Beamish and Crawford Brewery, Hanover Street and Bishop Lucey Park; and thirdly they settled on the adjacent northern valleyside, now the area of John Street in Lower Blackpool. 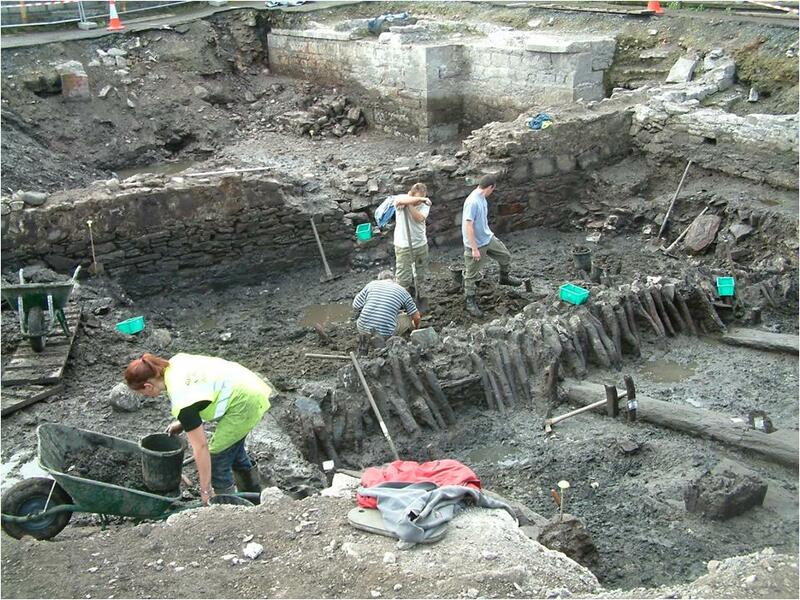 The publication Archaeological Excavations at South Main Street 2003-2005 (Brett & Hurley, 2014) records Hiberno Norse structures found under South Main Street area. On troweling back the earth, the archaeologists pealed back different temporal contexts. Two to three metres underneath our present day city, they exposed the remains of timber structures lingering, intrusive and protruding through the mud. there is an indication from the dendrochronological dates of the timbers found on the site that there was a continuous felling of trees and construction of buildings and reclamation structures from just a few years before 1100AD to 1160AD. So here on a swamp 900 years ago, a group of settlers decided to make a real go at planning, building, reconstructing and maintaining a mini town of wood on a sinking reed ridden and wet riverine and tidal space.